…with good luck, not with a solid strategy. So writes Sam Missingham in an astute article published yesterday, called “Print sales might be rallying, but don’t get complacent.” It should to be read by the management of every traditional publishing company. We’ve been inundated (once again) with stories of print’s resurgence, occasioned this time by an April report from the Publishers Association that UK print sales rose by 8% last year, while ebook sales fell by 3%. 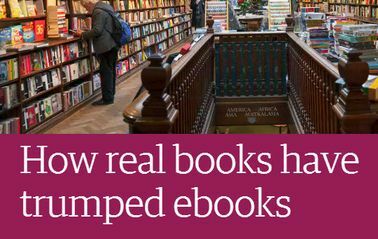 The headlines reveal the triumphalism of print’s cheerleading community: Paper book sales rise as e-books plunge, Physical book sales increase as ebook popularity continues to wane, and most ridiculously, How real books have trumped ebooks (real books?). After you read the rest of this excellent post join me over at Porter Anderson’s recent An Arms Race of Monetized Distraction (and don’t miss the comments). An April presentation by Kobo CEO Michael Tamblyn triggered his thoughts. Tamblyn describes the “fifth wave” in book retail, a force that pushes the competition for book publishing out into other media industries. It was Netflix CEO Reed Hastings who first alerted me to this concern; I wrote about it last year. Hastings described Netflix’s broad competition as video gaming, web surfing, watching DVD, TVOD, or linear TV, wandering through YouTube, book reading, streaming Hulu or Amazon, or pirating digital content. Netflix had revenue of nearly $9 billion last year, more than twice the sales of the largest trade book publisher, Penguin Random House. If Netflix is worrying about this range of competition for “relaxation time and disposable income,” shouldn’t book publishers be doing so also? The novel was brilliant. The show was genius. I want to read Ms Chaney’s next book. I cannot wait to watch the show’s next episode. Print versus digital has become like the old PC versus Mac wars… and about as pointless. I publish my books in almost every format and let readers choose. That seems the best option. I don’t recall books being mentioned in the Wall-E movie. But it isn’t hard to imagine their non-presence among so many “other forms of entertainment” as yet another illustration of how disturbingly prophetic that film is. Notice at the very end of that movie snippet, there’s a view of a pool, but no one is swimming in it. Those who made the movie are brilliant. And yes, as “Wall-E” illustrates, movies do have their place. It just shouldn’t be so large that it displaces almost all other away-from-work activities—not exercise, not socializing, and not reading. Turning Anne into a “moody modern feminist” is a particular obscene book-to-movie translation. The Anne of the book is so bright, bubbling, and happy, she overwhelms her somber, grumpy adoptive mother. Creating such vile literary-to-movie horrors is particularly cruel for kids growing up in modern, dysfunctional, single-parent homes. Above all others, they need to see an orphan who succeeds against all odds. And that’s why they need books that preserve the past untainted. Publish in every format “and let readers choose.” Sensible.